EcoJustice Education offers a powerful model for cultural ecological analysis and a pedagogy of responsibility, providing teachers and teacher educators with the information and classroom practices they need to help develop citizens who are prepared to support and achieve diverse, democratic, and sustainable societies in an increasingly globalized world. Readers are asked to consider curricular strategies to bring these issues to life in their own classrooms across disciplines. Designed for introductory educational foundations and multicultural education courses, the text is written in a narrative, conversational style grounded in place and experience, but also pushes students to examine the larger ideological, social, historical, and political contexts of the crises humans and the planet we inhabit are facing. Pedagogical features in each chapter include a Conceptual Toolbox, activities accompanying the theoretical content, examples of lessons and teacher reflections, and suggested readings, films, and links. The Second Edition features a new chapter on Anthropocentrism; new material on Heterosexism; updated statistics and examples throughout; new and updated Companion Website content. "A must-read textbook. Its strength is not only its powerful and carefully considered analysis but also its student-centered approach; the text seamlessly guides students through a multitude of challenging concepts and, at the same time, engages them with its potent and insightful arguments." "EcoJustice Education is not just another textbook. It is a bold vision for a possible future of social- and eco-justice. 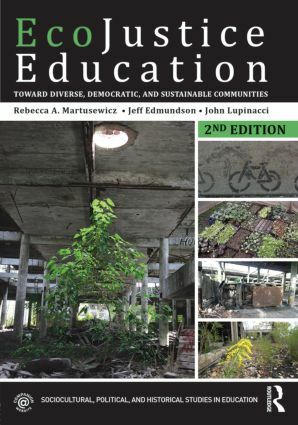 Accessible to students, teachers, and educators at all levels, Martusewicz, Edmundson, and Lupinacci make clear the important role education has to play and how educators can put to work in our practice the poignant and provocative thinking of Gregory Bateson, Gregory Cajete, Wendell Berry, and others." Rebecca A. Martusewicz is a teacher educator at Eastern Michigan University, where she developed a concentration in EcoJustice Education for the Masters in Social Foundations program. Jeff Edmundson directs the teacher licensure program at the University of Oregon and teaches courses in EcoJustice at the undergraduate and graduate level. John Lupinacci is an assistant professor of Cultural Studies and Social Thought in Education in the Department of Teaching and Learning at Washington State University. All three authors are active in EcoJustice Education, an international organization that includes the Center for EcoJustice Education offering faculty development workshops, The EcoJustice Dictionary, and other resources for teachers and scholars (www.ecojusticeeducation.org).